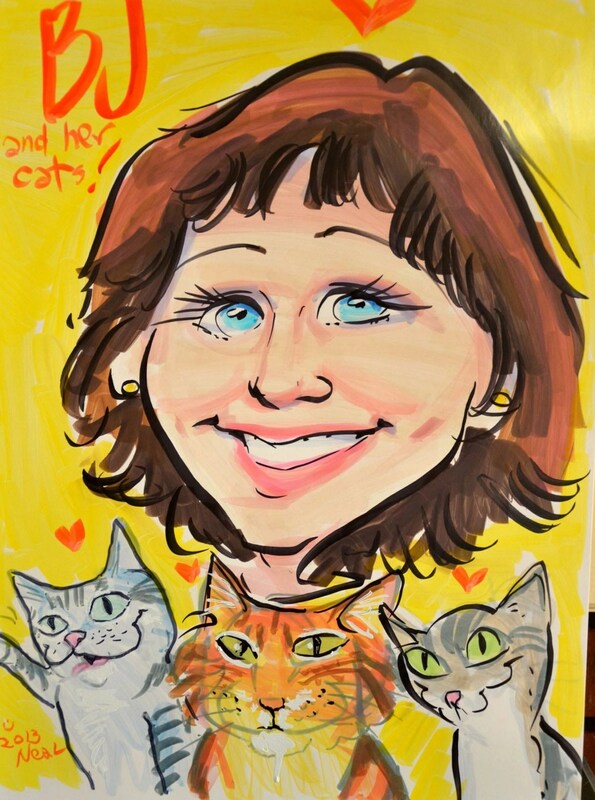 Ingrid King’s Purrs of Wisdom, Conscious Living, Feline Style show us humans how much we can learn from our cats. For me, it was the negativity created by just too much stuff. 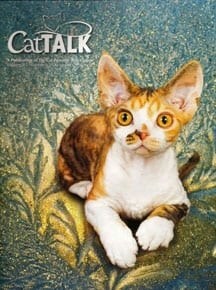 Her short essays detail how cats live in the now, not stressing over yesterday’s mistakes or tomorrow’s challenges. Cats live in a bit of Zen. They know how to meditate and relax. Indeed they do relax, sleeping some 15 to 20 hours a day. 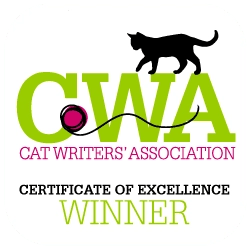 King is the award-winning author of Buckley’s Story: Lessons from a Feline Master Teacher, and popular blogger at The Conscious Cat. 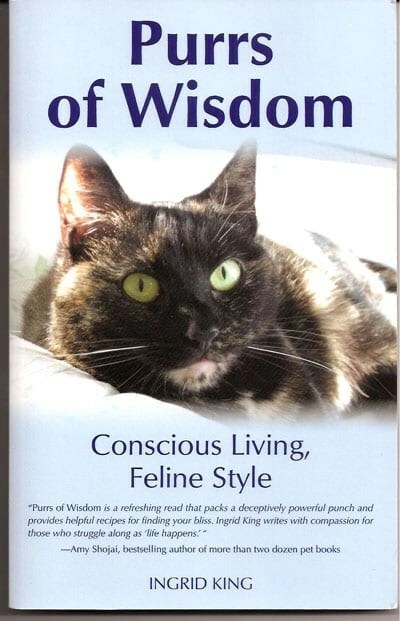 Her Purrs of Wisdom, Conscious Living, Feline Style is really a self-help book, focusing on conscience living in the now, with a bit of a different twist, coming from the eyes of what we can learn from our cats. She focuses on creating balance in our lives. A cat’s life is perfectly balanced, focusing on what’s important now. Cats can be entertained by simplistic things. They don’t have to spend a lot of money to be entertained. The one snippet that Paws’ mom walked away with was creating positive energy by purging (not reorganizing or getting rid of some stuff), but doing a major purge against clutter. Now, I admit I’m a pack rat, not to the extent of the world’s largest hoarders, but to the point of having way too much stuff and nowhere to put it. This past summer seemed like everything was in disarray. I started a new job, and had too much stuff in my car. I’d been waiting for a few consecutive days without rain to weatherproof my deck (when I wasn’t working). Too much rain made it hard to keep up with lawn work. There was nowhere to put stuff that I accumulated at BlogPaws 2013, so an unpacked duffel bag sat in the living room for the entire summer. Now all this stuff did not come about overnight. It’s years of memories. It’s also an accumulation of stuff from three households – mine, my parent’s, and my fiancé, who has been deceased for a number of years. My friend Mike also gave me a lot of stuff that his mom, now deceased, had. When I moved to rural New England to help take care of my mom, then in the beginning stages of Alzheimer’s, all this stuff and her stuff (crafts, dishes, sewing materials, etc) squeezed together to find a home. A few rooms were almost unmanageable, so much so that it was hard to walk through them. There was a major, major purge when I first moved in. But everything lay dormant for the most part since then. Four years ago, my mom went into residential care for Alzheimer’s. She had started wandering and her safety was at risk. Most of her every-day clothes went with her, and her dress clothes went to a second-hand shop. But the rest – it was just too overwhelming and to time consuming. I had thought about having her old bedroom downstairs remodeled. But where would I put all that stuff? Then King’s book. The light bulb went on. It was time for a major purge. Now that my sister was back living in the area, it made it easier because all mom’s sewing and craft stuff could go to her, and she could deal with all that stuff. I didn’t have the heart or desire to throw all that stuff on the dump. Furthermore, I didn’t even know what some of it would be used for. Now that I work four ten-hour days, rather than being catapulted all over the place with no schedule at the newspaper, I could dive into this project. It took hours and hours and hours. Most of my time off, when not dealing with life’s crisis, was devoted to this stuff. I’d look at things and say, do I need this? Am I ever going to use it? Where am I going to put this? What is it’s purpose. I even got rid of the old Does detergent wheat dishes from some 50 years ago (probably the best set of dishes my mom ever had – we were far from rich). The renovation began last Friday. There was room for the renovators to move in the hallway. There’s space for them to bring in the sheet-rock. The living room, while still cluttered, is much better than it was. Purging created room upstairs to move some of the stuff from mom’s old bedroom. I gave away an almost new queen sized bed so that I can replace it with a day bed, more conducive to my tastes. As I was going through the purging, I kept thinking about positive energy. I was creating room for positive energy to move in. I could feel the negativity leaving. Space was opening up. Opportunities would follow. And they are. The energy is contagious. Positive energy attracts positive things. If we are confident and surround ourselves by positive, good things will come our way. They already have. Paws has been stunned at the number of followers that have found our blog in the past few weeks. Our subscribers have increased by 75 percent in just three weeks – all from the power of that positive energy flowing through the house and into my being. The major purge was worth it. And do I miss the stuff? Except for mom’s sewing stuff, what it was is a dim, distant memory. Have you ever gone through your house from top to bottom in a major purge? What’s your worst clutter story? Please share your thoughts. And don’t forget to enter Paws For Reflections September Give-Away: four ten pound bags of Hills Science Diet’s Grain-Free dry cat food. To read Paws’ review, click here. Submit your name, mailing address, email, and contact phone number on this contact form to enter. Drawing will be the end of the day on Sept. 30. I sure do and I no how powerful it can be to release things. I rent, and I move fairly (or very) often, just for the fun of it. My favorite thing to do is to rely on the vacuum theory – good things always come in to fill up empty spaces with other neat things. I still keep that at a minimum, though. I am very happy for you, and this is a wonderful post! I totally agree with the vacuum theory. Something will replace something that goes away. I certainly hope that getting rid of clutter brings alot of positive energy to me, my kitties, my blogging, and my life.